Tom's preview: Saints know exactly how it feels to need a reaction in front of their own fans. And, consequently, they recognise the size of the challenge that awaits them at Kingsholm this weekend. Gloucester come into the game on the back of a 57-10 evisceration at the hands of Sale Sharks. The AJ Bell battering will have hurt everyone of a Cherry and White persuasion. And the supporters will expect a huge response from their players this Saturday. The task for Saints is to make sure that even if they provide one, it does not prove to be enough. Saints will not want to suffer as Leicester Tigers did at Franklin's Gardens earlier this season. 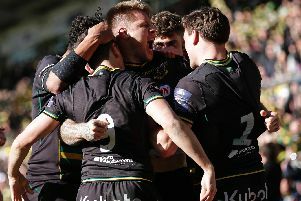 On that day, a fired-up team in green, black and gold finally smashed their east midlands derby hoodoo to pieces. Fuelled by a sobering 55-24 defeat to Saracens at Twickenham seven days earlier, Jim Mallinder's men issued an almighty riposte. And they have since put together a four-match winning streak that has propelled them to the top of the Aviva Premiership pile. Gloucester may even use Saints as a glowing example ahead of this weekend's encounter. But that will mean nothing to Mallinder's men if they leave Kingsholm without a fifth win from six league matches to their name. Make no mistake, another victory would be massive for Saints. It would carry them into the Champions Cup clashes with Saracens and Clermont Auvergne on the crest of a wave. And it would put them in a very healthy position with more than a quarter of the league season complete. They would have negotiated three away matches and won two, backing up a home record of three triumphs from as many outings. And everything would be rosy at the Gardens. But those are possibilities rather than reality right now. And Saints recognise they will have to do the dirty work if they are to avoid going the same way as beaten champions Exeter Chiefs and struggling Worcester Warriors. Both of those teams have lost at Kingsholm this season, with Gloucester enjoying a 100 per cent start on home soil. There is no doubt that they are a very different beast when playing at their west country abode rather than on the road. Saints know that, but they have won on their past two visits to Kingsholm. And if they can combat the inevitable reaction this weekend, they can claim another victory that would mean so much in the race to return to the play-off picture.